When it comes to grocery shopping I generally try sticking to a list. But I'm not immune to impulse buying and standing in an endless checkout queue leaves more time to stare at the shelves. 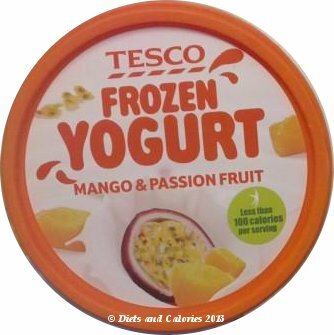 So it was as I was queueing right alongside the freezer cabinets, that I spotted a new product – Tesco Mango & Passion Fruit & Natural Frozen Yogurt Dessert. 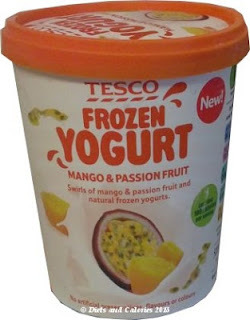 But what persuaded me to give it a try was the 'Less than 100 calories' sign on the front of the tub. Frozen yogurt is often seen as a healthier alternative to ice cream. It's true, it can be, but not always. 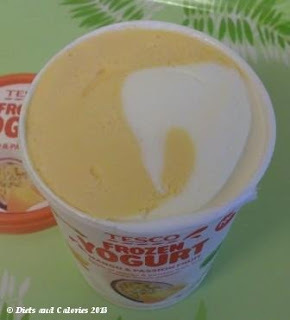 In this case, Tesco’s frozen yogurt is low in fat, saturates and salt, but it is high in sugar. The calorie content is also significantly lower than the average ice cream. 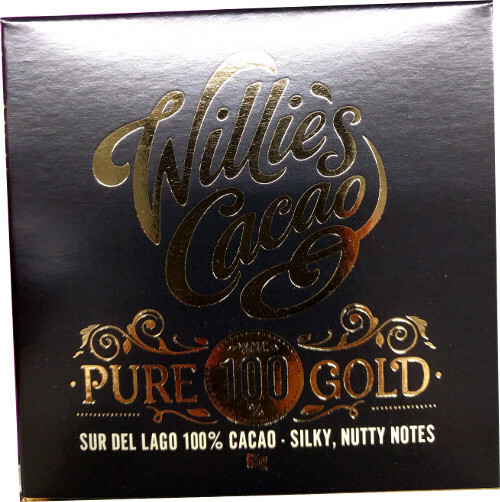 The recommended serving size is 68g which provides you with 80 calories. Serving sizes are subjective and if you don’t exactly measure out 68g, it’s unlikely you’ll end up with 80 calories. Most ice cream tubs provide the recommended serving size for a scoop, but these scoop sizes vary enormously. So I decided to forget about scoops and measure out in dessert spoons just how much 68g is. I was expecting it to be some minuscule amount, like just one spoon, but I was pleasantly surprised. I scooped out 3 heaped dessert spoons before the scales measure 68g and this is a decent amount. (See photo). 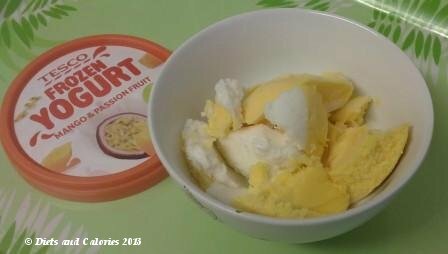 The yellow part of the frozen yogurt is where the mango & passion fruit flavour is. This has a delicious sweet flavour which has more of a passion fruit taste. I couldn’t really detect any sort of flavour in the white part which I imagine is the natural yogurt. Altogether, it’s a lighter type of frozen dessert which is sort of a cross between ice cream and sorbet. Yogurt accounts for 50% of the ingredients with mango and passion fruit just 4.5%. 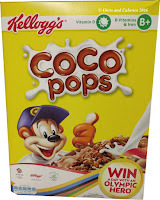 Other ingredients include skimmed milk, sugar and glucose syrup. So far this is the only flavour I’ve seen and it comes in a 500ml tub. Suitable for vegetarians. No artificial flavours, colours or preservatives. 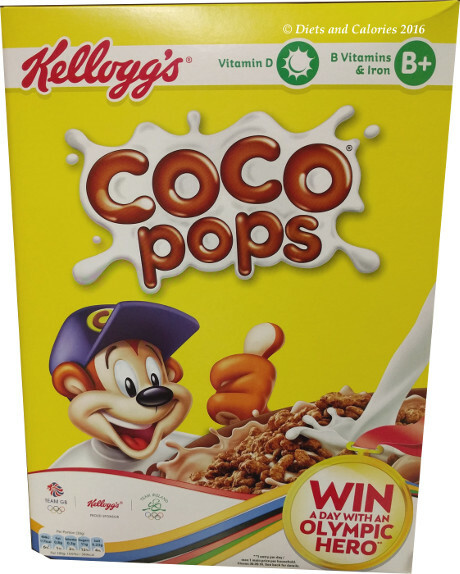 Nutrition information per 100g: 115 calories, 2.9g protein, 22.7g carbs, 15.6g sugar, 1.1g fat, 0.7g saturates, 0.9g fibre, 0.2g salt.